Year 12 Geography students from Canberra Girls Grammar School recently visited The Mulloon Institute's living laboratory at Mulloon Creek Natural Farms for a day of learning and discovery. 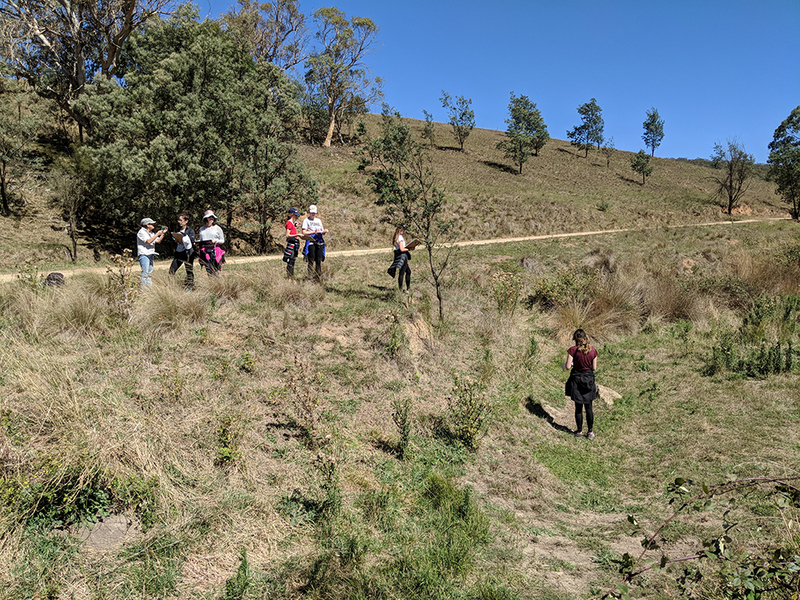 Students started with learning how to assess ephemeral drainage lines, such as the one at Mulloon Creek Natural Farms, which originates in woodland on top of the Great Dividing Range and ends at a series of restored wetland chain of ponds below. Ephemeral drainage lines are an important feature in the landscape that students study as part of the NSW Geography curricula on sustainable biomes. Under the instruction of TMI’s Research Coordinator Luke Peel, students assessed six sites as they walked downstream, with two sites in each of the three different creek zones at MCNF – woodland, upland paddock hills, and restored wetlands. Assessment involved scoring indicators of slope, vegetation, cross section and longitudinal profiles, as well as erodibility features of the landscape leading into the creek, creek walls and floor. The students found the process to be logical and practical even for first time users. The scoring system of the different zones, combined with land use and management, provided good examples of landscape processes that differentiated the stability and functionality of each site. Although the wetlands were looking quite dry at the end of summer, students learnt to identify the presence of certain plants (such as grasses, forbs and sedges) as indicators of wetland conditions. Students also learnt about the role wetlands play in filtering the water flowing through the system, and how wetlands provide habitat for many threatened species of flora and fauna. On a broader scale, the students learnt about the Natural Sequence Farming Pilot Project at MCNF and how this has expanded out into the catchment scale Mulloon Community Landscape Rehydration Project. Discussion then took place around the importance of adequate scientific monitoring in the context of these projects. The students were very enthusiastic and quick learners and certainly benefited from seeing real life examples of drainage processes and examining the components that define a landscape as stable, eroding or repairing. Assessing a small gully head. Assessing a chain of ponds.